Originally chartered in 1846 to be a transporter of anthracite coal from the vast coal fields of Pennsylvania, the Lehigh Valley Railroad grew into a major carrier of both freight and passengers between Jersey City, New Jersey, and Buffalo, New York. Its first connection to the Finger Lakes region was in 1871. That year, the Southern Central Railroad, financed by the Lehigh Valley, completed a line primarily for coal from Athens, Pa., to North Fair Haven on Lake Ontario via Owego and Auburn. In 1876, the Lehigh Valley took control of the newly reorganized Geneva, Ithaca, and Sayre Railroad, started by Ezra Cornell of Ithaca. The famous university that he founded in 1865 would fill regular and special trains with college students and their families for decades. The line to Geneva provided the Lehigh Valley a means to construct their own line into Buffalo, but its grade out of Ithaca to Geneva was too steep for heavy freight trains to travel. A diverging route was planned from Van Etten (then known as Van Ettenville) to Geneva along the east side of Seneca Lake. In 1892, the new bypass was open and the line was also completed from Geneva to Buffalo. The original route from Van Etten to Geneva via Ithaca was now used for passenger trains and local freights. A large freight yard and locomotive servicing facilities were constructed by the Lehigh Valley in Manchester along their new route between Geneva and Buffalo. Opened on September 1, 1892, the Manchester freight transfer yard was built to transfer and expedite less than carload shipments. Records indicated that it loaded and unloaded more than one hundred freight cars a day. Once recognized as the largest yard in the world, it employed over 1,000 people during its peak of operations. After years of declining freight traffic, the Manchester Yard was closed in 1970. Still standing today are the remains of a 30-bay roundhouse and turntable built in 1916. During the late 1800’s and into the early 1900’s, the Lehigh Valley built and acquired numerous feeder lines in upstate New York. These included a line north from Ithaca following the east side of Cayuga Lake to Auburn via Cayuga and a bypass around Buffalo for traffic to and from Canada via Niagara Falls. Lines also arose from Geneva to Cayuga, joining the New York Central Railroad “Auburn Road” branch just east of Seneca Falls to cross Cayuga Lake; from Geneva to Naples; from Rochester to Hemlock Lake; and from Elmira to Oneida Lake via East Ithaca, Cortland, and Canastota. The Lehigh Valley was well-known for its passenger service. With its double track mainline to Buffalo traversing our area, the cities of Ithaca and Geneva had busy passenger stations, both of which still exist today along roadbeds long since removed. 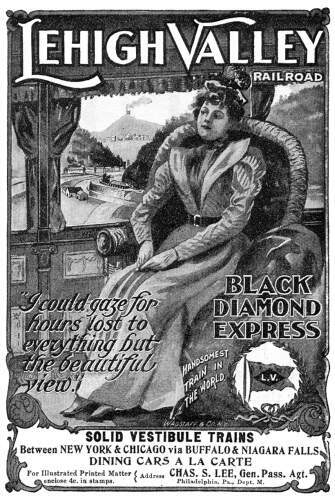 Trains such as the Maple Leaf (with connections to Toronto) and the Star traveled the area, but the premier passenger train was the Black Diamond Express. On August 25, 1911, the second worst passenger train wreck in the history of the Lehigh Valley occurred in Manchester. Train Number 4 eastbound out of Buffalo derailed on the Canandaigua Outlet bridge due to a broken rail. One passenger car overturned on its side while two other passenger cars behind it fell off the bridge into the creek bed 40 feet below. A total of 29 were killed and 62 were injured in the wreck. As with most railroads, trains and tracks began to rapidly disappear on the Lehigh Valley after World War II. Passenger service ended between Ithaca and Auburn in 1948. The Black Diamond and Star made their final runs on May 11, 1959. Early in the morning of February 4, 1961, a blinding snowstorm welcomed the final Lehigh Valley passenger train into Geneva, the Maple Leaf. Given its lateness and the storm, the passing of an era went almost unnoticed. The Lehigh Valley came under the control of the Pennsylvania Railroad in 1962 as a result of years of red ink. With passenger service gone, the track from Ithaca to Geneva was removed in 1963. The double track mainline was single tracked during the mid-1960?s because of declining freight traffic. By the time the Lehigh Valley went bankrupt in 1970, the operating portions of the railroad in the Finger Lakes region were its mainline to Buffalo via Geneva, a branch from Sayre to Moravia via Owego, a branch from Freeville to Cortland, a branch from Van Etten to Ithaca and north along Cayuga Lake to a power plant near Lansing, a branch from Geneva to Rushville, and a branch from Rochester Junction near Honeoye Falls to Rochester. Either gone or abandoned were all the tracks that led to places like Auburn, Canastota, Elmira, Naples, and North Fair Haven. On April 1, 1976, the Consolidated Rail Corporation (Conrail) took over operation of the Lehigh Valley Railroad. Most of the Lehigh Valley mainline in upstate New York was removed by the late 1970’s. Today, only segments between Sayre, Pa., and Van Etten, Kendaia (former Seneca Army Depot) and Geneva, and Manchester and Victor remain in service. The Lehigh Valley Railroad began in the coal fields of Mauch Chunk (later Jim Thorpe), Pennsylvania. Anthracite coal lay close to the surface and could be mined by hand with pick and shovels. The nearby Lehigh River offered transportation downstream to the markets of New York City and Philadelphia. Development of a good regional network of coal companies, canals, and railroads led to the Lehigh Valley Railroad. 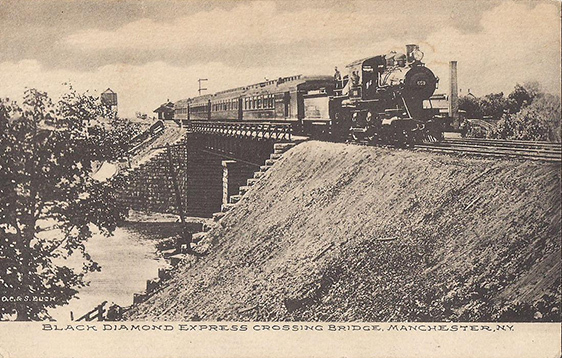 The desire to reach the western markets of the Great Lakes led to a mainline stretching 200 miles across upstate New York and other branches serving central New York and the Southern Tier. Using the lands of the Morris Canal Company and other acquisitions, the LVRR developed many harborfront facilities in NY Harbor and most of the boroughs. A fleet of tugs serviced New York City's docks. In 1895, the LVRR-controlled trains reached Waverly, NY. Coal and freight was transferred to the wide gauge cars of the Erie Railroad for the trip west to Buffalo. The arrival of LVRR trains in Buffalo over Erie trackage in 1876 signaled the start of a significant investment in lakefront development and the start of a Great Lakes shipping fleet. 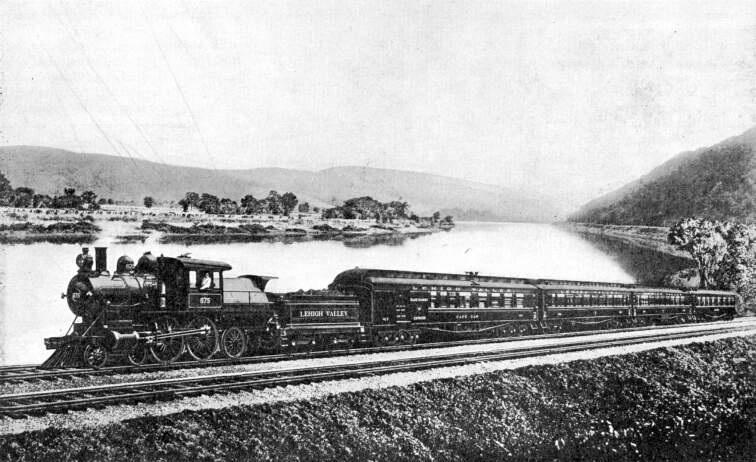 The 1870s saw the LVRR grow to include the Southern Central from Waverly to Owego and Auburn and reaching Lake Ontario at Fairhaven. Another branch connected Elmira, Ithaca, Cortland, Cazenovia, and Camden. Rochester, Hemlock, Naples, and Seneca Falls were served by other branches. In 1918, LVRR passenger trains began using Penn Station. Manchester served as a division point and car classification yard from the day the New York State mainline opened on September 1, 1892. As a division point, crews and locomotives were exchanged. Freight cars were switched from track to track, organizing them for delivery to their destinations. Support services included the 30-stall roundhouse, the coaling stations, facilities for ash removal, track maintenance, car repair, a control tower, the yard office, an ice house, and the bunkhouse-restaurant. In 1913, a freight transfer facility was build for less-than-carload (LCL) lots. Railroading has always been a special kind of dangerous job. With the prestige of working for a railroad came the daily dangers. Injuries and death were always feared. The heavy weight of all railroad items and the speed of the trains created an atmosphere where all employees had to be alert at all times. Male and female employees worked at all kinds of jobs. All kinds of physical and mental skills were needed. There are nearly 100 job descriptions associated with railroading.